It probably wasn’t how head coach David Quinn drew it up, but he’ll gladly take three out of four points from this past weekend’s series with the University of New Hampshire. After slumping hard, the No. 4 Boston University men’s hockey team clawed its way back to the status quo, outscoring UNH 12-8 across two contests. It got underway with a 4-4 tie at Agganis Arena on Friday night, then wrapped up with an 8-4 win for the Terriers over the Wildcats up in Durham, New Hampshire on Saturday evening. Friday’s sider about some unexpected lines. Saturday’s side about a comprehensive team effort. The Cloonan line – The third line of Kieffer Bellows, Chase Phelps and Ryan Cloonan looked strong all weekend. It finished with six points on Friday night and displayed some true chemistry. All three players have dipped at various points in 2016-17, so it’s nice to see them hitting their stride. Shuffled lines – Speaking of lines, who on Earth expected Doyle Somerby to play as a fourth line winger? That’s how crazy the new lines were, but some of the combinations bore fruit. The top line of Jordan Greenway, Jakob Forsbacka Karlsson and Clayton Keller can score at any moment. Meanwhile, the group of Nick Roberto, Patrick Harper and Bobo Carpenter isn’t too shabby, either. For JFK, the changes were necessary after a 6-3 loss in the Beanpot final to Harvard on Monday. Team Defense – The defense needs to tighten up big time, though. UNH’s top line of Tyler Kelleher, Jason Salvaggio and Michael McNicholas was potent all weekend, and BU had no answer for them. When stronger teams come around, the Terriers can ill afford to let star players shine like Kelleher and Co. did. Patrick Harper – Harper had himself quite the weekend, too. He had three points on Saturday night, and quietly now has 31 points on the year. For one, Quinn called hailed his performance. Third Period – This is still a third period team. After struggling in both first frames against UNH, BU bounced back in a major way come the third period. Across the weekend, the Terriers outscored the Wildcats, 6-0, in the stanza when it matters the most. It's official… @TerrierHockey has clinched a first-round bye in the Hockey East playoffs. We'll host a quarterfinal series beginning 3/10. Kieffer Bellows: "We have our swagger back." With just three games remaining in the regular season, the No. 4 Boston University men’s hockey team is back in action on Saturday night. This go around, head coach David Quinn’s side visits the University of New Hampshire for a 7 p.m. game at the Whittemore Center. We’ll be there all evening for the night’s actions, so be sure to follow along below! The No. 4 Boston University men’s hockey team is back in action Friday night, hosting the University of New Hampshire at Agganis Arena. Puck drop is set for 6:05 p.m. and the game will be broadcast nationally on the American Sports Network. We’ll be live for all the game’s action, so follow along via our live blog below! There’s an aura of déjà vu around Agganis Arena. For the second time in three weeks, the No. 4 Boston University men’s hockey team approaches the weekend looking to break out of a two-game skid. This go around, the opportunity comes via a home-and-home series against the University of New Hampshire, with Friday night’s game at Agganis and Saturday evening’s at the Whittemore Center. For a full version of this story, click here for Jonathan’s preview on The Daily Free Press. DURHAM, New Hampshire — For a few seconds in the third period, the No. 9 Boston University men’s hockey team had what it wanted, and standings-wise, arguably needed. There was some not-so-pretty play throughout its game at the University of New Hampshire, but BU gained a late lead on senior assistant captain Danny O’Regan‘s goal with 2:32 left in the third period. In terms of the playoff picture, holding onto the lead would have kept BU within one point of No. 11 University of Massachusetts Lowell for fourth place in Hockey East. But just as quickly as BU (17-9-5, 10-5-4 Hockey East) scored, it gave the lead right back. Thirty-five seconds after O’Regan’s tally, UNH forward Maxim Gaudreault tied the game at 3-3. That’s where things would stay for the final 1:57 of the third and the five minutes of overtime, so the Terriers ended with a draw against the Wildcats (10-15-6, 4-9-6 Hockey East) at the Whittemore Center. There was some good, some not as good and other stuff in between in this one, so we’ll break it down in this Pluses and Minuses. Different wingers, good defenses, anyway you slice it, BU’s first line during its previous three games struggled to get anything going. O’Regan, in particular, had gone three consecutive games without a point, matching a career-long scoreless streak that only happened one other time in his career, late in Feb. 2014. That streak would not last into a fourth game, however, with O’Regan striking for three goals, the second collegiate hat trick of his career. He came through with the first goal 12 seconds into the second, off a nice cross-ice feed from freshman winger Jordan Greenway. A little over six minutes after, while BU was in the midst of a power play, O’Regan one-timed a shot that trickled off goaltender Danny Tirone’s pads and past the the goal line. The latter of the three saw O’Regan get to the netfront and wrist the puck high over Tirone. O’Regan’s line has already changed a number of times this year, and it looked a little bit different with Greenway alongside freshman center Jakob Forsbacka Karlsson. At least for the night, the changes paid off, as the freshmen added two points apiece. Greenway, who was on BU’s top line to start the year, has gotten back to where he started, in large part because of his ability to use his physicality to his advantage. Two points through the first 13 games, Greenway now has 21 total — fifth on the team. You could argue that this could be a minus because BU only scored three times. In the same breath, though, it was not as if BU didn’t get the puck to the net or close to it. In total, the Terriers accumulated 70 shot attempts as compared to UNH’s 30. Especially in the first and third periods, BU’s shot attempts came from in close range in the slot or near the crease area. If momentum does indeed exist, it did not last long for BU on Friday night, and that became more pronounced in the final minutes of the third period. Off a BU turnover, UNH possessed the puck in the Terriers’ zone and also controlled the area in front of the crease. That’s where Gaudreault was when he rebounded in the tying goal, not even 40 seconds after O’Regan gave BU the lead. Yet that wasn’t the first time the Terriers allowed a goal shortly after scoring one of their own. After BU’s second score, winger Jamie Hill snuck behind BU’s third defensive pair, junior Doyle Somerby and sophomore Brien Diffley, walking in alone from the offensive blue line to the net, where he slipped the puck under LaCouvee. 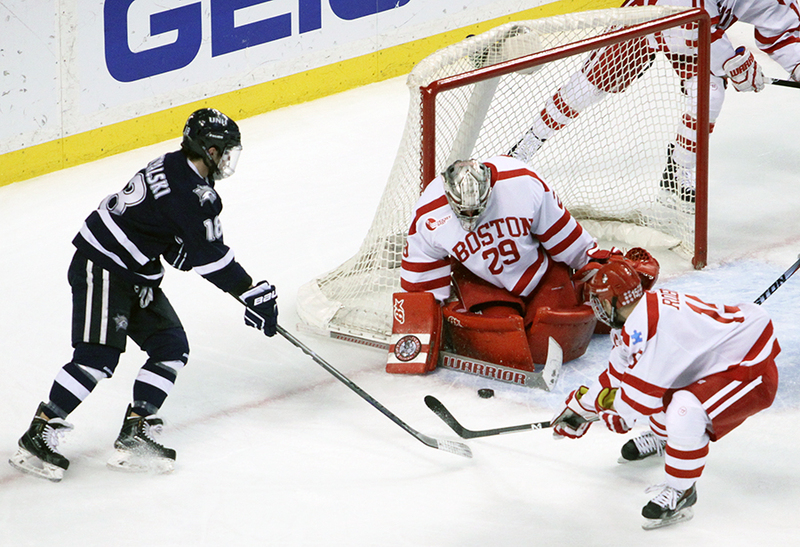 Quinn expressed his frustration with his team’s missed assignments on UNH’s final goal. Quinn said after the game that he was more pleased with the way his power-play unit played this time out. But there was one disappointing aspect. BU could not break through when given the chance on a five-minute major. In fairness, the extended man advantage did carry over from the second period to the third, but the Terriers did not get a lot of great looks on net and also were not as quick on the puck as they probably would’ve liked. The process is getting better for the power play, but Quinn said he would like to see the rubber hit the twine more during such opportunities. For the second time in three seasons, the Boston University men’s hockey team will play for the Hockey East championship. Facing off against a red-hot University of New Hampshire squad that had won nine of its last 10 contests, the Terriers (24-7-5) ricocheted from yet another slow start to best the Wildcats (19-19-2), 4-1, Friday night at TD Garden. The Terriers will have little time to rest following their victory, as they will face off against two-time defending conference champion University of Massachusetts Lowell Saturday night. As with every hockey game, there were a good amount of positive and negative takeaways Friday night. Here they are. Fresh off of earning Hockey East Second Team All-Star honors Thursday night, junior goaltender Matt O’Connor lived up to newly awarded accolade against the Wildcats, standing tall in the Terrier crease to the tune of 32 saves — his highest save total since stopped 32 shots against the University of Vermont on Jan. 23. The Toronto native especially came up big over the first 20 minutes of play, negating a multitude of sloppy plays from the blueliners in front of him by holding an opportunistic and aggressive Wildcat offense to just one goal. A pivotal moment came in the closing minutes of the stanza, with UNH holding onto a 1-0 advantage. As the Wildcats vied for yet another tally, forward Andrew Poturalski fired a puck on net that a sprawling O’Connor deflected at the last second with his pads, keeping it a one-goal game. Less than 20 seconds later, the Terriers capitalized, with senior assistant captain Cason Hohmann lighting the lamp at 17:38 to knot the score at one goal apiece. O’Connor is now 21-3-4 on the year with a 2.09 goals-against average and a .930 save percentage. Despite sitting out the past three games due to an upper-body injury, freshman defenseman John MacLeod failed to show any rust in his return to action Friday night. The blueliner was steady out on the ice, tying defensive partner Matt Grzelcyk with a game-high plus-four rating on the night while also earning his seventh assist of the season on Hohmann’s first-period score. The Tampa Bay Lightning prospect also paid dividends on defense, stopping a potential Wildcat goal in the third period. With the Terriers clinging to a 2-1 lead, sophomore defenseman Doyle Somerby sent a shot from the blue line that was blocked by a UNH skater, generating a breakaway opportunity for New Hampshire. As the UNH skater coasted into the Terriers’ zone, MacLeod hustled back and swooped into the skater’s lane, disrupting his easy look on net. Freshman forward Chase Phelps picked an awful good time to score his second goal of the season. With Friday’s match locked in a 1-1 draw, the Terriers’ fourth line buzzed around the UNH net, attempting to generate some semblance of an opportunity against New Hampshire goaltender Danny Tirone. Junior forward Mike Moran coasted the puck along the end boards to sophomore forward Nick Roberto, who motioned from behind the UNH cage and put the puck on net. As the puck settled near the crease, Phelps quickly flipped it over Tirone, handing BU its first lead of the night. It was the Shattuck St. Mary’s product’s first goal since Nov. 29 against Colgate University. While BU’s formidable first line was mostly held in check over the first 40 minutes of play, freshman center Jack Eichel could not be muted for long. The young forward capped the Terriers’ scoring on the night with two goals in the final 10 minutes of play, both off of rebound offerings off the stick of senior assistant captain Evan Rodrigues. With his two strikes, Eichel has extended his point streak to 11 games, notching 23 points during that stretch. Now standing at 63 points on the season, Eichel needs just one more to stand as the second-highest scoring freshman in NCAA history. For the third time this season, the Terriers dropped the puck at TD Garden. And for the third time in this arena, the Terriers underwhelmed with their performance in the first period. BU appeared sluggish and indecisive both in terms of defense and offense over the first 20 minutes, with the Wildcats outshooting the Terriers by an 11-8 margin. While it appeared that the Wildcats consistently outplayed their opponent throughout the period, O’Connor’s strong play and Hohmann’s goal were able to help the Terriers escape the stanza still locked in a 1-1 tie. Throughout the first period of play Friday night, BU’s four freshman defensemen sure looked like … Well, freshmen. A key factor in the team’s lackluster performance in opening frame can be attributed to a few choice plays from its rookie defensemen. In particular, Brandon Fortunato and Brandon Hickey coughed up a costly turnover in BU’s own zone, directly leading to a goal from UNH forward Tyler Kelleher at 14:34. For more on the Terriers’ sluggish defensive play (and subsequent redemption), check out Andrew’s sider. Did you guys think that you had a chance to come back entering the third? How good was it to get back on the score sheet? Matt Grzelcyk has been on a pretty good streak the last couple games. What do you think has been different about his play, at least offensively? How much do you think last night’s game contributed to the slow start today? Down 3-0, [Quinn] called a timeout and pulled [junior goaltender Matt O’Connor.] What was the message in that timeout? First of all, a great effort by our guys in the third period, but I’d like to congratulate UNH. I thought they played real well early, I thought they played real well for the weekend. Like I said last night, their record’s real deceiving. We just obviously came up here, and I thought we got off to a decent start. Great chances early, and then just irresponsible play defensively. A lot of puck watching in our end. But they can do that to you. As a coach you’re always trying to wrestle with, are you the cause of not playing well or are they playing well and it’s causing you to be on your heels a bit? I thought it was a little bit of both. But you can’t get down 4-0 to anybody in this league, and give yourself a chance. But we did. I thought when we made it 4-3, I really felt we had the momentum, and they did a good job holding the fort. Just a tough way to start the game, being down 4-0 at the beginning of the third period is just something that — the chances of coming back are minimal. And we almost did it, but didn’t get done. One guy thought that the guy gained the line, the other guy thought they tipped it. So I didn’t like either answer. After post shot at the end of the 2nd, did you think you’d come back out with energy? Well, based on what we’ve done all year, I did think that. One of the things we talked about was hey, I don’t know if we can come back, let’s just play better. Let’s play better. Let’s feel good getting on the bus. At least we put forth a consistent effort for 20 minutes. And then we get the two quick ones, and all of a sudden the complexion of the game changes in the third. Although I thought we gave up some unnecessary chances after we made it 4-3. We only needed one, and we were playing like it was 4-0. We gave up some great chances to make it 5-3. Our goalie played well, and gave us a chance to tie it. But based on what we’ve done all year, I was anticipating a lot of pushback. I thought we started doing it a lot toward the end of the second, too. But we just couldn’t buy a goal. Just momentum. Had nothing to do with his play. He’s played a lot of hockey and I just thought what the heck. They’re not listening to me up to this point so maybe if I pull the goalie they might actually get a little rattled and pay attention. They scored a goal a minute later, so that didn’t really work. It’s nice because we’re gonna need him to be productive offensively. I really couldn’t believe he only had one goal going into the weekend, so it’s nice to see him score some goals and get rewarded. He’s had a heck of a year. How did UNH stop top 2 BU lines? I haven’t criticized our top line too much, but they didn’t have to do too much to defend our line. They were doing a good job defending themselves with their soft play. What goes into third-period comebacks? I can’t tell you that. There is a secret formula that we continue to use that we’ve bottled it and we can’t reveal it. (laughter) I have no idea. I wish I could tell you. I have no idea.